Many people believe the key to all their budgeting and debt woes is simply to make more money. A 2015 SunTrust survey found almost 1 in 3 respondents making $75,000 per year or more live paycheck to paycheck on occasion and 1 in 4 respondents making over $100,000 reported the same. Thirty percent of respondents blamed a lack of financial discipline and 70 percent of millennials (ages 18-34) who believe they are not saving as much as they should blame dining out expenses. Tackling a related topic, Esquire wrote two pieces 4 Men with 4 Very Different Incomes Open Up About the Lives They Can Afford and 4 Women with 4 Very Different Incomes Open Up About the Lives They Can Afford. They’re both an interesting read. Esquire’s respondents had income levels of near poverty, $80,000, $350,000, and $1,000,000 for the women and $1,000,000, $250,000, $53,000, and near poverty for the men. There are at least three things overlooked when people discuss how much home, car, and total debt they believe they can afford based on their income. Let me begin this section by clearly stating: It’s your money. We didn’t help you make it. You can spend it however you want. But, if each paycheck you consistently have more month at the end of your money, the following might help you understand why. If you’re online long enough, you’re familiar with the “I WOULD NEVER…” crowd. Recently, our guest for PB51: The Financial Samurai came on to discuss his viral piece, Scraping By On $500,000 A Year: Why It’s So Hard For High Income Earners To Escape The Rat Race. Our first discussion on this topic was one of our fastest downloaded shows ever. While we mostly received positive feedback from our listeners, I did see the “I would never…” comments around the internet. Regardless of the context of the discussion, the “I would never” personality type draws sweeping conclusions that begin with “I would never…” and conclude with “…spend $200 on a date; $15,000 on a ring; $100,000 on a car; $650,000 on a home!” The amount of the particular expense the internet is fighting about that day doesn’t matter because a true “I would never…” would never spend it. These people are universally frugal, financially responsible stewards and a statistical anomaly to all things personal finance. This is only strange because social media readily shows that most of these same people’s credit utilization compared to their estimated income already commits more of their salary and debt to the exact same categories they judge others about. They just don’t realize it, or maybe they don’t care. The latter would actually make more sense, but that would also imply the internet is bound by sense-making rationale. To simplify this discussion, we’ll use three gross incomes to estimate how much home, car, and other debt they can afford on $30,000, $50,000, and $100,000 based on best practice recommendations from various industry leaders and lenders. The following monthly breakdown is recommended for each expense category: 30% for mortgage/housing ratio (or rent equivalent), 10% for a car (includes principal balance, interest, and car insurance); and 10% for debt. Keep in mind that banks and lenders are businesses. They are not your friends (or your enemies). Even the above industry-recommended scenarios would put you nearly 50% in debt each month. Banks are lenders. They are not in the business of telling you how much lifestyle you can afford. They are in the business of telling you how much they can lend you to spend, so they can make a profit and maximum return on their investment in you. It is your responsibility to determine what lifestyle you can afford. Depending on where your monthly payments fall, the table above either made you really relieved or really upset. Let’s explore some possible reasons why. The simplest of which is that $100,000 isn’t always $100,000. This is why we recommend you use the free CNN Money Cost of Living Calculator if you’re ever thinking of moving or relocating around the country and you want to understand how far your money will or will not go in your new city. If you want an even more detailed breakdown, we recommend using BankRate’s Cost of Living Calculator. BankRate’s even more detailed calculator will tell you everything you need to know down to whether you can still afford cheese on your cheeseburgers (or avocados on your toast). In the scenario below, our home-based city will be Austin, Texas. AnonymousInternetPerson247 listened to the PaychecksAndBalances podcast and is considering jobs in the following cities. 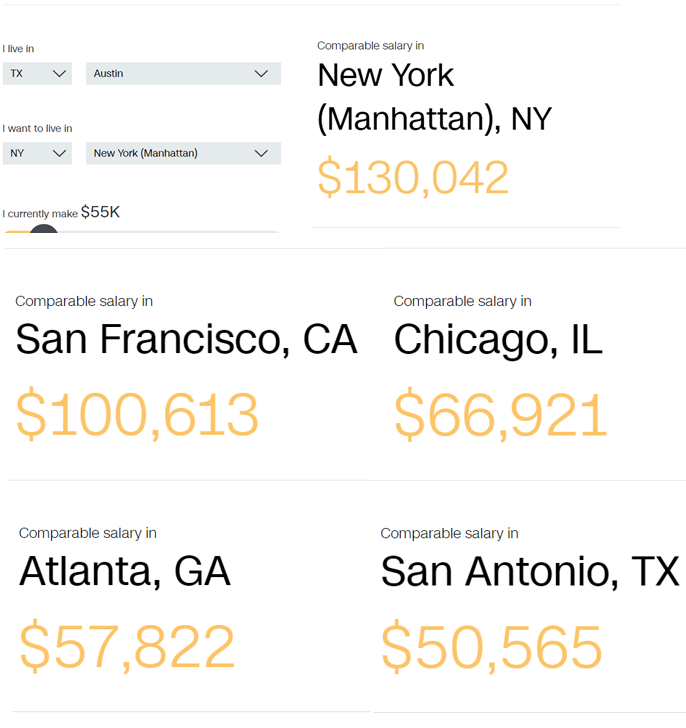 They use CNN Money’s calculator to estimate how much comparable gross salary they’ll need to make in these cities to maintain the lifestyle they’ve become accustomed to at the equivalent of $55,000. As you can see, they need to find a job making over $100,000 in places like New York and San Francisco. Also, cost-of-living can vary widely within the same state, which is why they can maintain the same lifestyle on $5,000 less if they relocate to a lower cost of living city, like San Antonio. Always Stay Gracious. The Best Revenge is Your Paper. The beauty of the internet is that it brings together a wide range of people from every background you can think of. Most days, this is a good thing. However, comparing $100,000 in New York to $100,000 in California is not one of those things. It’s not apples-to-apples or even money-to-money. It’s wrong to incorrect. The same can be said for most every other city in the United States. More importantly, whether you are an “I would never…” yourself or simply a casual observer of an I would never discussion, 2 outta 3 people don’t even have a budget or know how much they are spending day-to-day, month-to-month, or year-to-year. Is it possible that 100% of these people are not represented in these online conversations? Yes, but I doubt it. If you want to be like everyone else, you need not change anything about your spending habits or your personal finances. You can do the exact same thing today and expect a different outcome tomorrow, but the odds are not in your favor. Now if you want a different outcome than the average person, you’ll need to make the personal decision to think differently, then you’ll need to act differently. If you practice good personal finance habits, spend less than you earn, and do this consistently over time, one day you might be lucky enough to have someone comment on your social media, “I would never…” and you can react with the best response of all time: no reaction.